Yemen: Peace on the Horizon? The Houthis and the former President of South Yemen introduced somewhat similar peace proposals for ending the War on Yemen. 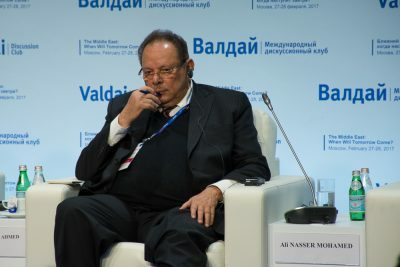 The first move in this direction was made during last week’s Valdai Conference on Russia’s role in the Mideast, when Ali Naser Mohamad, who presided over the People’s Democratic Republic of Yemen from 1980-1986, issued an 8-point plan for resolving the conflict in which his most unique suggestion was to “initiate a dialogue between all the political forces on the establishment of a two-region federal state.” This was clearly in reference to the Southern Transitional Council’s (STC) seizure of Aden, their former capital, from Hadi’s government at the end of January after the internationally recognized leader refused to reform his Cabinet and reportedly ordered that force be used against the protesting Southerners. Federalization has long been thought of as a “compromise” between wartime allies Saudi Arabia and the UAE, the first of which began the war in order to reinstall Hadi as Yemen’s President while the latter is thought of having a favorable approach towards the Southern separatists. As for the Houthis’ proposal, it interestingly mirrored most of what the former South Yemeni leader proposed, albeit with its own nuances. Both sides want an end to the war, new elections, and UNSC support, though they seem to differ over some technicalities. Whereas the South wants a federal solution, the Houthis importantly suggest that all contested issues be decided by a referendum, with the implication being that it would be a nationwide one where the more populous North would have the electoral power to reject any regional-centric proposal put forth by the South. The issues of South Yemen’s autonomy and the country’s corresponding constitutional reform to legalize this desired status seem to be the primary difference between each party’s peace proposals. In the stalemated military situation that defines the present day, neither side is able to enforce their will on the other, but the most important observation is that the political will for peace invariably exists in the territories that used to comprise the independent countries of North and South Yemen. Extrapolating from this, it can be deduced that each of their populations are completely exasperated by this war, especially the majority of the country that resides in the North and has been forced to endure the insufferable humanitarian consequences of the coalition’s war against the Houthis for over the past three years now. Likewise, presuming that the former South Yemeni President was speaking in a semi-official capacity and “testing the waters” at Valdai, the conclusion can be reached that the STC is “moderating” its independence aspirations and willing to settle for federalization, at least at this stage, which of course appeals to the Saudis and the Houthis for different reasons and makes it easier to begin a dialogue on ending the war. In the coming future, all sides will likely readjust their positions somewhat as they politically jockey with one another in preparing for inevitable peace talks, and it’s here where Russia could play a strategic role in facilitating this by mediating or possibly even hosting this dialogue whenever it ultimately happens.